Sunday we drove to Murray, Kentucky to stay overnight for the total solar eclipse. Evansville was just north of the totality zone so it got a 99% eclipse. I was originally planning on staying here for it, but as I started doing research totality sounded really cool and like a necessary experience. So I figured out a of where to go. I live about 1.5 hours north of Hopkinsville, Kentucky, which was one of the best places to view the eclipse in the nation. But since the estimated traffic was over 100,000 people, I decided there was no way we were gonna deal with that. 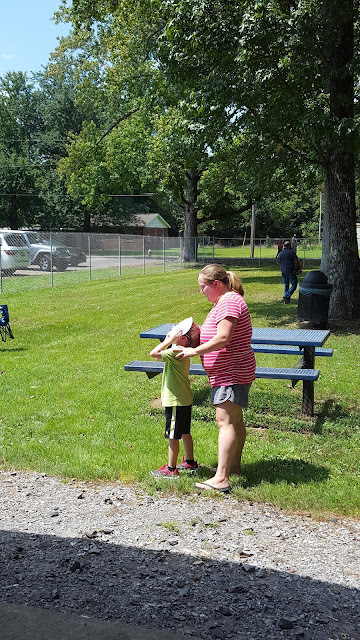 I decided to go to Marion, Kentucky originally because we would get 2.5 minutes of totality and it's off the beaten path, but large enough that it has a park and a McDonalds and stuff. But, Alan did a hotel search on Friday and found a hotel room in Murray for Sunday night, so off we went. Murray was just outside of totality, by about 10 minutes so we still had to travel, but we were already in the area. The hotel gave us a list of places that were having viewing events and we decided to check out one that was supposed to have a farmer's market but it was kind of lame and there was nothing for the kids to do for five hours since we left super early to get into the zone. So, we went to Hardin, a tiny town about 15 minutes north of Murray with a park and a library that was having a eclipse party. We got there around 9AM and there was one other family there. The kids played at the playground and we went over to the library to do some crafts and just hung out. It was really cool seeing it gradually get darker and more like twilight all around us. Except when it was about 20 minutes until totality and these giant clouds started going by. We weren't sure we were going to see it at all and sure enough, we saw maybe 10-15 seconds of totality before the sun was covered by a cloud. It was really really cool and I wish we could've seen more of it. It got really quiet and the cicadas started buzzing. It didn't get completely dark, but it was like a 360 degree sunset and you could see a few stars, which were actually Venus and I think Jupiter. The temperature also dropped. The photo I took on my phone. 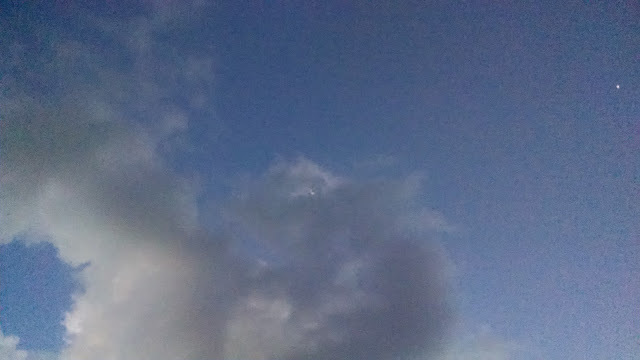 Venus is the star on the upper right, the sun is the tiny speck of light in the cloud. I'm pretty disappointed that that happened because I keep seeing photos from others on Facebook that actually got to see it. It is what it is, but it was a let down. Ewan thought it was really cool and Cecily was just like oh it's dark, I'm gonna go play on the swings now. The good news for us is that in 2024 there's another total solar eclipse and this time Evansville will be in totality. All I'll need to do is go out into the backyard to see it!